A traditional gift for a newborn baby, or as a Christening or baptism gift. Give the gift of savings. 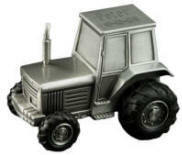 This satin finished tractor coin bank features a moveable front scoop and moveable wheels. We can personalize the top of the tractor. This children's tractor bank is gift boxed. Measures 5 1/2 in. wide x 3 1/2 in. tall. Ahoy maties! 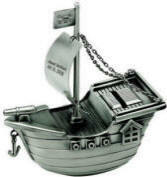 This fun pirate ship coin bank topped with a sail can be personalized with engraving to create a fun and functional coin bank. Realistic details are in the skull and cross bones flag, anchor, portholes and deck. Save all your pieces of eight, and then empty it through the removable stopper on the bottom. Sail can be engraved with a first name, a date, or up to three lines of text. Measures 6 in. x 5 1/2 in. x 2 1/2 in. Giving an engraved bank is a unique way to give a gift of money. Present the bank with the money inside and start a child saving. 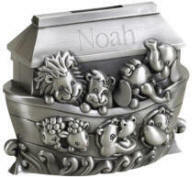 This adorable nickel plated pig bank can be engraved on the side with a child's name and date. The coin slot is on the top of the bank, and a rubber stopper is underneath the pig for coin removal. Measures 5 in. x 3 3/4 in. x 4 in. Gift boxed. One of our most popular new baby or Christening gifts, or as a gift for a ring bearer. This nickel plated train bank has the appearance of silver, and can be personalized with baby's first name and birth date or Christening date, or the date of the wedding for a ring bearer gift. We personalize with engraving in your choice of lettering to create a unique and practical keepsake gift. Giving an engraved bank is a unique way to give a gift of money. Present the bank with the money inside and start a child saving. The train measures 6" in. x 3.25 in. This pewter finish football bank is the perfect gift for the newest member of your team. The football bank can be personalized with baby's first name and birth date. An adorable welcome baby gift for any sports fan. This football coin bank measures 4 1/4 in. x 2 3/8 in. x 2 in. This all metal satin finish coin bank can be emptied through the removable stopper on the bottom. We can engrave with a name and date on the top of the tractor bank to create a personalized gift. Measures 3 in. x 4 in. x 3 in.